We believed that we would win, and now we are seeing workplace standards rising! 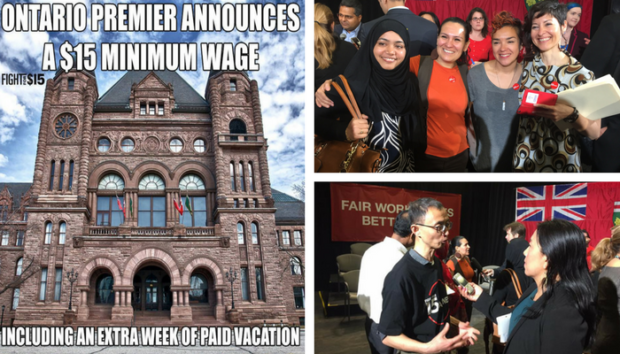 The Ontario government just announced its plan to raise the minimum wage to $14 on January 1, 2018 and then to $15 on January 1, 2019. This overdue increase, along with some improvements to our labour laws, will be a direct result of the incredible organizing efforts of workers, organizers, and our allies. Thank you and congratulations to everyone who has supported the Workers’ Action Centre and our dedicated membership. The general minimum wage goes up to $15 within 18 months. The minimum wages of students and liquor servers will rise by the same percentage (32%), but will still remain under $15. Part-time, casual, temporary, contract workers, and temporary agency workers will receive equal pay to that of full-time, permanent workers. Temp agency workers will receive equal pay from day one of their assignment. To ensure fairer scheduling, employers who cancel shifts with less than 48 hours notice will have to pay workers 3 hours’ wages. 10 emergency leave days will now be extended to all workers, and 2 of those days will be paid. Workers will not be expected to pay for doctor’s notes to access their emergency leave. 1 extra week of paid vacation after staying at the same job for 5 years. Contract service workers will have protection against contract flipping in the building services sector and publicly-funded institutions. There will be an important extension in card-based certification for union organizing for temp agency workers, the building services sector, homecare and community services. Other measures will be put in place to make it easier for workers to join unions. 150 more employment standards officers will be hired to help enforce labour laws. As Premiere Wynne spoke at the May 30th press conference, it became clear that the government has taken on our mandate of “fairness.” However, their legislation is still missing some elements. After the long and involved process of completing the Changing Workplaces Review, it would be a shame if obvious loopholes were left in place for bad employers to leap through. Make sure to call your MPPs and tell them which changes you appreciate as well as what can be improved. To understand the implications of the new legislation, read the $15 and Fairness analysis of the May 30 announcement. Already, there is a forceful pushback from employers who don’t like to be told what to do. Many employers claim to have good practices, such as fair scheduling, yet they say this approach of making new laws is “adversarial.” But if employers currently have good workplace conditions, then these new laws would simply validate their fair practices and force competing businesses to also raise their standards. Meanwhile, the voices of employers who understand the value of labour and the need to invest in good workplace conditions are largely being silenced in the media. You can help fight the negative backlash by writing letters-to-the-editor in support of this proposed legislation. As we congratulate everyone on this momentous achievement, we also ask you to continue having conversations about $15 and Fairness. Speak with your co-workers, family and friends about how better standards at work will benefit our communities and local economies. Let’s make our win as big as it can be!